This universal tablet holder clamps to any desk up to 2.25" thick and provides maximum reaches of 20.5" horizontal and 21" vertical. Now any tablet (Apple, Samsung, etc.) at least 6.75" wide can be positioned at the optimal location in the workstation. They can be put alongside the monitor (for viewing) and brought in closer when input or access is required. 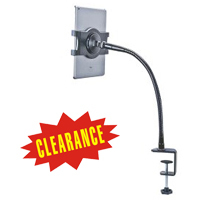 The black gooseneck provides sufficient resistance to allow the full use of the tablet without undesired movement. The TabletRiser from Bakker Elkhuizen is an all-in-one tablet stand and carry-case for those who use their tablets heavily for work or pleasure. 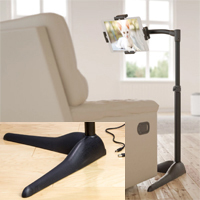 When placed on a desk or table, the stand elevates the tablet to the proper height for prolonged usage, whether in landscape or portrait mode, and allows the viewing angle to be adjusted along a continuous range for optimal positioning. Secured to the stand via a slim magnetic pad, the tablet can be rotated a full 360 ° while in use, and removed as desired. 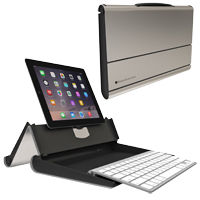 The TabletRiser also provides storage for an external compact keyboard. When not in use, the TabletRiser folds up to become a sleek, protective carry-case, complete with handle, that allows tablet and keyboard to be stored together and safely transported. Included is a protective mouse pad. 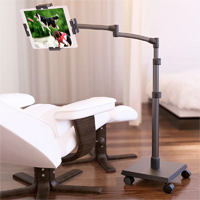 The Universal Foldable Tripod Tablet Stand from Aidata is a stable, foldable tablet stand that is great for travelling. 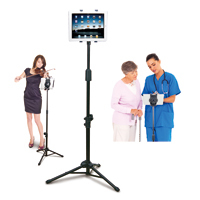 With its collapsible tripod base and telescoping pole, this stand is portable and easily stored using the included nylon carry case. 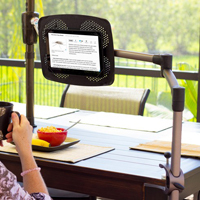 The tripod stand provides 30" of height adjustment and the bracket (which holds most tablets from 7" to 10.1") can be rotated 360° and angle adjustable to meet the specific viewing requirements of any user. The bracket features a quick release which enables users to quickly detach the bracket and tablet as a unit for portability without needing to remove the tablet from the bracket. The sturdy tripod base provides stability even with the stand at the maximum elevation. 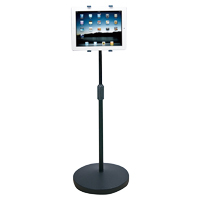 The Universal Tablet Floor Stand from Aidata is a stable and sturdy tablet stand that is great for stationary use. 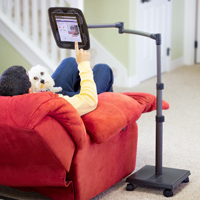 The telescoping stand provides 21.5" of height adjustment. The bracket (which holds most tablets from 7" to 10.1") can be rotated 360° and angle adjustable to meet specific viewing requirements. The bracket features a quick release that enables users to quickly remove it from the base for transport, without first needing to remove the tablet. The heavy base provides stability even with the stand at the maximum elevation. 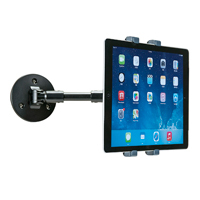 The Universal Tablet Wall Mount with Arm from Aidata is ideal for mounting a tablet to a wall, cabinet, desk, or any other flat surface (must be able to attach via 3 screws). 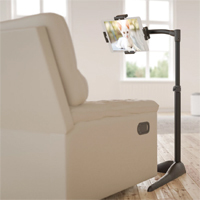 The extension arm gives a maximum horizontal reach of 8.25" while the spring-loaded bracket (which holds most tablets from 7" to 10.1") can be rotated 360° and tilt adjustable to meet the specific viewing requirements of any user. The bracket features a quick release which enables users to quickly detach the bracket and tablet as a unit for portability without needing to remove the tablet from the bracket.